Pro-Bashar al-Assad regime forces, including Russia and Iran, forced the reconciliation and evacuation of two of the three opposition-held pockets in the besieged Eastern Ghouta suburbs of Syria’s capital, Damascus. Salafi-Jihadist group Ahrar al-Sham fully evacuated the town of Harasta under a deal brokered by Russia. Activists reported that roughly 4,500 local residents, including more than 1,400 fighters, ultimately departed Harasta for Idlib Province on March 22 – 23. Islamist group Faylaq al-Rahman agreed to a similar evacuation deal in Irbeen, Zamalka, Ayn Tarma, and Jobar in Eastern Ghouta on March 23. Activists reported the departure of at least 13,100 local residents on March 24 - 26. Salafi-Jihadist group Jaysh al-Islam – the last remaining opposition powerbroker in the region - is meanwhile negotiating its own surrender and disarmament in its stronghold of Douma in Eastern Ghouta. Assad will soon claim a near total victory in Damascus. Key Takeaway: Russia will likely intensify its campaign to disrupt Latvia’s political stability ahead of Latvia’s fall 2018 parliamentary elections. The Kremlin may use rising social tensions over a new Latvian educational bill as just one tool to fuel divisive narratives and trigger large-scale protests. The U.S. should support NATO ally Latvia as it confronts Russia’s hybrid warfare and use the upcoming April 2018 Baltic Summit to reinforce its commitment to defend Latvia, Estonia, and Lithuania. Russians and Russia-linked actors are escalating tensions over a controversial Latvian education bill. The Latvian Parliament approved the final reading of a draft language bill on March 22, 2018. The bill aims to gradually transition Latvia’s education system from mixed Latvian-Russian language instruction to Latvian-language based. Russian Foreign Minister Sergey Lavrov accused the Latvian government of forcing Russians in Latvia to abandon their heritage. Moscow-linked political-social organizations have attempted to halt, delay, or alter the legislation. The Russian government-linked Russian Union of Latvia (RUL) organized protests against the bill, including protests of around 1,000 individuals on February 24 and March 10, though pro-Russia sources claimed 3,000-5,000 people attended. The RUL is currently attempting to challenge a decision by the Latvian government blocking a public referendum on the bill in Latvia’s Supreme Court. The RUL is also petitioning the EU to recognize the bill as an infringement on minority rights. It called on several EU and NATO states, namely Hungary and Romania, to support the “Rescue Package for National Minorities” which would grant minority groups across the EU increased autonomy. The Kremlin may fuel these tensions to destabilize Latvia ahead of the fall 2018 Latvian elections. The Kremlin seeks to destabilize Latvia in order to reassert influence over the former Soviet state, to test NATO unity, and to drive further divisions within the EU. The Institute for the Study of War (ISW) assesses that the Kremlin is most likely to undertake a multifaceted approach, potentially including the use of irregular troops, if it chooses to escalate in Latvia rather than conduct a large-scale, short-notice conventional ground operation. The Kremlin regularly uses tensions over language as means of destabilization. ISW assesses that the Kremlin is fueling escalation between Hungary and Ukraine over a similar Ukrainian language bill in order to seed social unrest in Western Ukraine and drive a wedge between Ukraine and its neighbors. The Kremlin could exploit existing tensions surrounding the Latvian language bill to boost divisive narratives and destabilize the political landscape. Latvian officials have already expressed concerns about the Kremlin’s intensifying interference in Latvian affairs, which may be indicative of the Kremlin’s increasing campaign of subversion. The Latvian Foreign Minister warned about the Kremlin’s escalating disinformation campaign ahead of the elections while he was in Washington on March 7, 2018. Latvian parliament member Ainars Latkovskis warned on February 21 that the Kremlin is attempting to “add more fuel to the fire” of a Latvian banking crisis in order to “create chaos in Latvia by portraying it as a failed state.” Latvia’s Defense Ministry warned on February 20 that “there is a high probability [of an] externally organized widespread information operation…that, by its structure and execution, is identical to those observed in pre-election periods in the U.S., France, and Germany.” Latvia’s Security Police warned on March 19 that Russian intelligence services continue to pose a “significant threat” to Latvia and are continuing their efforts to recruit Latvians and infiltrate key Latvian government institutions. Signs of the Kremlin’s accelerating campaign to destabilize Latvia could include large-scale protests, sudden attacks on Russian-language speakers, and cyber attacks. The U.S. and its Western allies should support NATO ally Latvia’s efforts to bolster its defenses as it confronts Russia’s hybrid campaign. Latvia should continue with its gradual approach to implement the language bill, if passed, so it does not provide additional opportunities for the Kremlin to exploit. The U.S. and its partners should support Latvia in its efforts to deny Russia the ability to foment political unrest and vie for domestic political influence. These countermeasures could include bolstering efforts to ensure that Kremlin-backed media does not dominate the information space for Russian-speaking Latvians, increasing tailored support to Latvian intelligence and law enforcement, and other mechanisms that can support an early detection and adequate response to a Russia-fueled destabilization campaign. The upcoming Baltic Summit in April 2018 hosted by President Donald Trump presents an opportunity to reinforce the U.S. and NATO commitment to defend allies against the full range of Russian warfare. 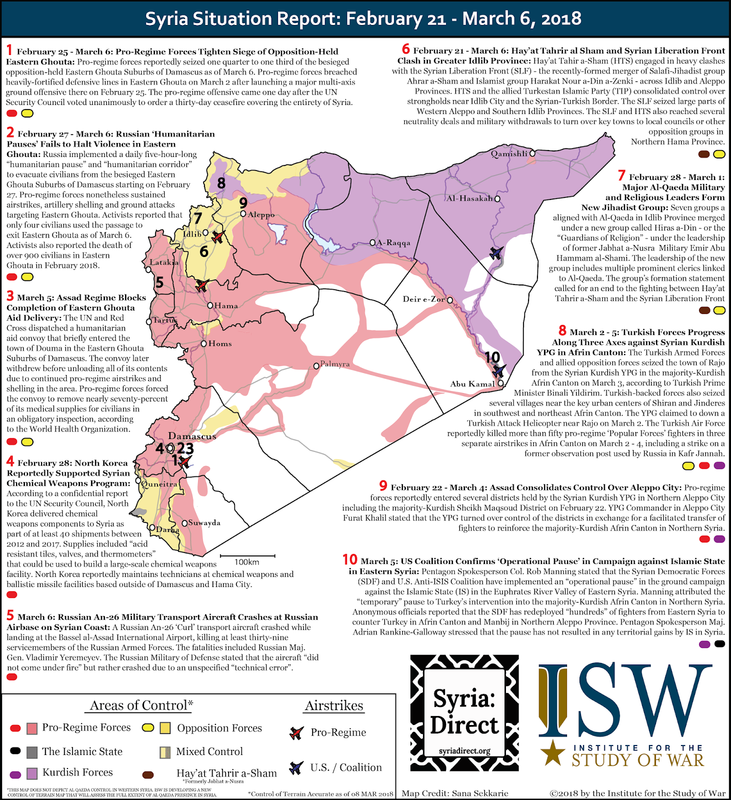 This graphic marks the latest installment of the Syria Situation Report (SITREP) Map made possible through a partnership between the Institute for the Study of War and Syria Direct. This graphic depicts significant developments in the Syrian Civil War from March 6 - March 20, 2018. The control of terrain represented on the map is accurate as of March 22, 2018. Key Takeaway: Turkish President Recep Tayyip Erdogan has threatened to conduct military operations across six locations in eastern Syria and Iraq following the Syrian Kurdish withdrawal from Afrin City in northwest Syria. Russia and Iran seek to use Turkey to undermine the U.S. and may encourage Turkey to prioritize operations in areas that would put American forces at risk, disrupt U.S. supply lines, and constrain U.S. military operations, creating further opportunities for the Islamic State of Iraq and al Sham (ISIS) to resurge in southeastern Syria. The Syrian Kurdish People’s Protection Units (YPG) ceded Afrin City to Turkey on March 18, 2018. Syrian Kurdish YPG forces and tens of thousands of Kurdish civilians withdrew to the towns of Tel Rifaat, Nubul, and Zahra before Turkish Armed Forces (TSK) and Turkish-backed rebels arrived in the city center. The YPG announced a transition from conventional fighting to a guerilla campaign against Turkey and its partner forces in Afrin. 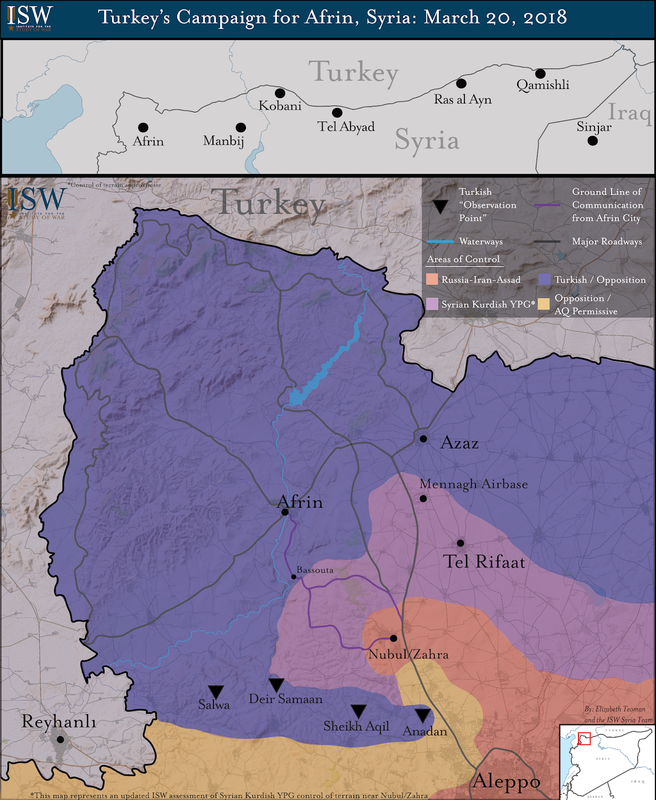 ISW assessed previously that Turkey’s Operation Olive Branch pursued five operational objectives: secure the Syrian-Turkish border, isolate Afrin city, seize the Mennagh airbase, secure ground lines of communication, and establish a new forward line of troops (FLOT) to serve as a future “de-escalation” line with pro-Bashar al Assad regime forces including Russia. The YPG decision to withdraw from Afrin City allowed Turkey to take direct control, which may not have been a necessary outcome for Erdogan. Turkey is now working to establish a new forward line of troops with pro-regime forces and deployed an additional “observer position” on the front line west of Aleppo City in Anadan. It is unclear whether Erdogan intends to capture the Mennagh airbase, north of Tel Rifaat. The TSK could outfit Mennagh as a rotary wing airbase to support counter-insurgency operations in Afrin moving forward. Erdogan threatened on March 19 to conduct additional military operations at six possible locations in Syria and Iraq. He stated that Turkish forces may attack Kurdish forces in Syria’s Manbij, Kobani, Tel Abyad, Ras al Ayn and Qamishli in addition to Iraq’s Sinjar areas. He may calculate the YPG is vulnerable in Eastern Syria due to its attrition fighting Turkey and its commitment to waging an insurgency in Afrin. Turkish Foreign Minister Mevlut Cavusoglu previously announced the Government of Iraq had agreed to conduct joint operations against the Kurdistan Workers’ Party (PKK) in northern Iraq on March 8. Cavusoglu claimed operations would begin after Iraq’s elections scheduled for May 12. Erdogan may have acquired Russian and Iranian support for further military operations during a tripartite meeting in Astana, Kazakhstan on March 16. Russia and Iran seek to use Turkey to undermine the U.S. and may encourage Turkey to conduct operations in areas that would make U.S. forces vulnerable. A Turkish operation in Sinjar, Iraq could disrupt the U.S. and YPG supply line into northern Syria through the Fishkhabour Border Crossing. Turkey likely needs Iran’s approval to conduct an operation in Sinjar. Iranian proxy forces are heavily deployed along the Syrian-Iraqi border north of Sinjar. A Turkish operation in Syria against Manbij or Kobani would put U.S. forces directly at risk. Operations farther east threaten to destabilize U.S. rear areas and could force a contraction of U.S. forces to a smaller footprint, creating opportunity for ISIS to resurge in southeastern Syria. Turkey, Russia, and Iran may finalize an agreement during a tripartite presidential summit in Istanbul scheduled for April 4. American officials will reportedly meet with a visiting Turkish delegation in the coming days as part of discussions focused on resolving bilateral disputes, including in Syria. The working group will likely continue prioritizing the future of Manbij, which lies east of Afrin on the banks of the Euphrates River. The YPG-dominated Syrian Democratic Forces currently control Manbij with support from U.S. forces. Turkey has set conditions to besiege Syrian Kurdish-controlled Afrin City in northwest Syria. Turkey will use its military position as leverage in tripartite negotiations with Russia and Iran in Astana, Kazakhstan on March 16, 2018. 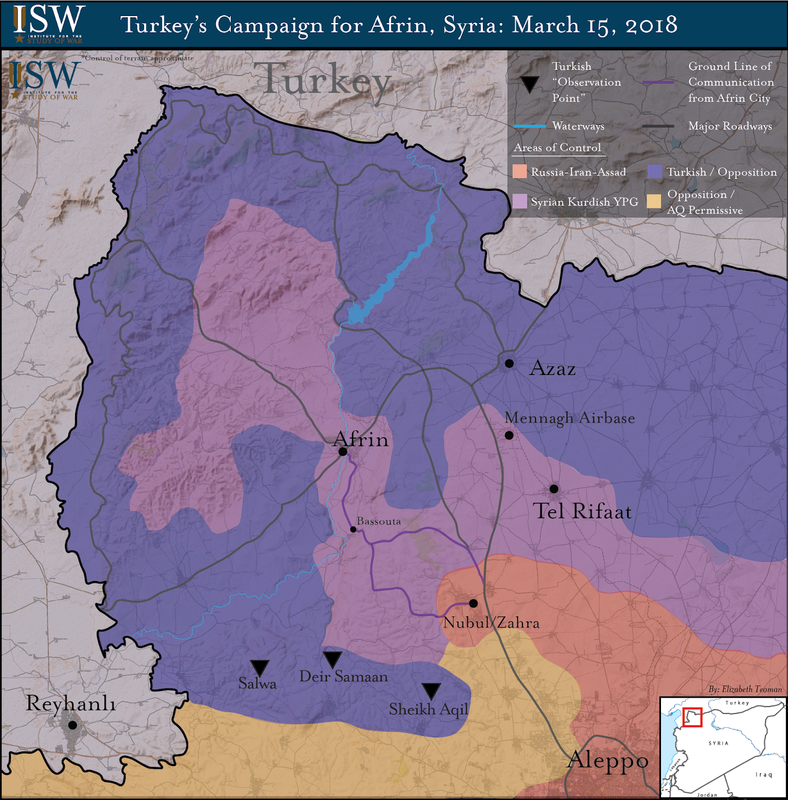 Turkish forces and Turkish-backed Syrian rebel forces seized positions that enable them to sever the last ground line of communication to Afrin by March 15. The advance has driven tens of thousands of civilians toward terrain held by the Bashar al Assad regime and its allies. Turkey’s likely primary goal in the Astana negotiations is to reach an agreement with Russia and Iran over the future of Afrin and other Syrian Kurdish People’s Protection Units (YPG)-held areas north of Aleppo City. Pro-Bashar al-Assad regime forces including Russia and Iran successfully split the besieged Eastern Ghouta suburbs of Damascus into three separate opposition-held pockets following the seizure of Mesraba and Madyara on March 10 – 11. The advance separated the city of Douma – the urban stronghold of Salafi-Jihadist group Jaysh al-Islam – from the densely populated suburbs of Irbeen, Zamalka, and Ayn Terma dominated by Islamist group Faylaq al-Rahman. 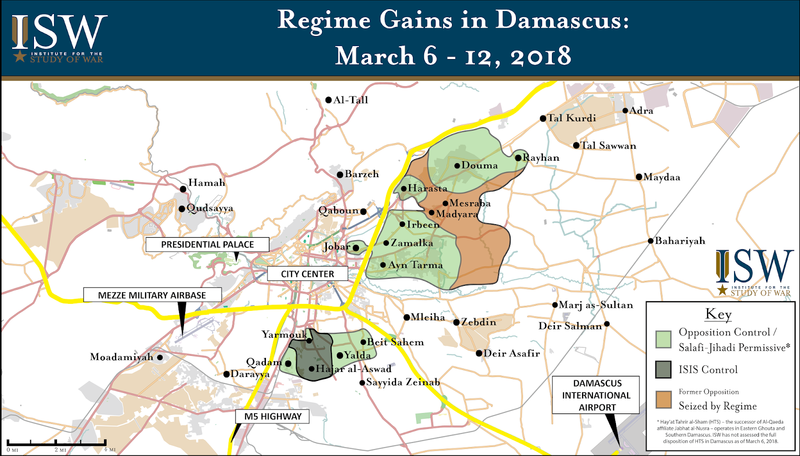 Pro-regime forces will further intensify their targeting of civilian populations and infrastructure within these new pockets in order to coerce their surrender and achieve the forced displacement of opposition-supportive populations from Damascus. This series of graphics marks the latest installment of our Syria SITREP Map made possible through a partnership between the Institute for the Study of War and Syria Direct. 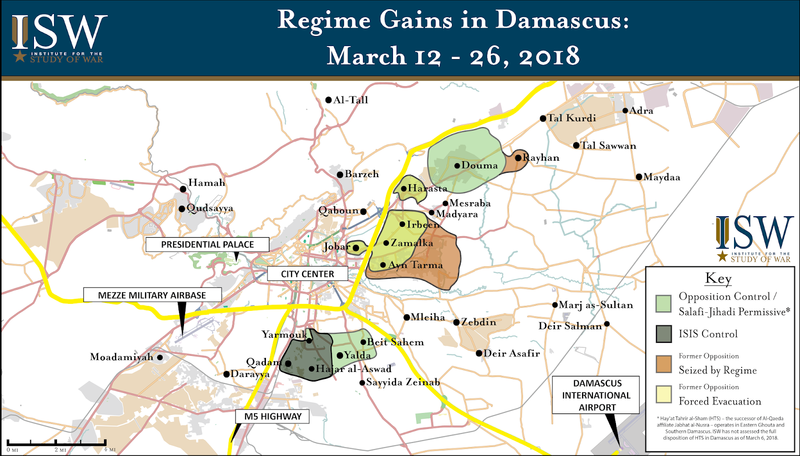 These graphics depict significant developments in the Syrian Civil War from February 21 - March 6, 2018. The control of terrain represented on the graphics is accurate as of March 8, 2018. Key Takeaway: Iraqi Vice President Ayad Allawi is presenting himself as a viable Shi’a reformist alternative to Prime Minister Haider al-Abadi in the upcoming Iraqi legislative elections slated for May 12, 2018. Allawi is setting internal conditions to recreate his strong 2011 bid to secure the premiership. Allawi– a secular Shi’a politician– seeks to reunite the Sunni political leadership under a secular platform akin to the Iraqiyya coalition that won 92 seats in the Iraqi Council of Representatives (CoR) under his leadership in 2010. Allawi will likely leverage his opposition to the expansion of Iranian influence in Iraq, reformist stance and support for the Kurdistan Regional Government (KRG) to draw Shi’a Sadrist and some Kurdish support in the post-election premier selection phase. Allawi can then maximize on his strong ties with Arab countries, including Saudi Arabia, Egypt and Jordan, to augment his premiership bid. Allawi is using his secular and nationalist credentials as well as his support for Sunni grievances as core pillars of his strategy to draw the Sunni vote. Allawi has arguably been the most prominent secular figure in the Iraqi political process since 2003. Allawi is highlighting his consistent secular credentials and his rejection of the sect-based division of power as major Sunni and Shi’a Islamist parties gravitate toward a secular campaign strategy. This shift coincides with an apparent public discontent with Islamist rule post-2003. The Vice President has also amplified his nationalist rhetoric, rejecting Iranian influence in Iraq and calling for the integration of the Iranian-backed PMF into the Iraqi Security Forces (ISF) following the defeat of ISIS. Allawi has advocated for the ability for internally displaced Sunnis to return to their homes as a condition for holding the elections. However, this is unlikely to be implemented fully due to security concerns and lack of infrastructure. Allawi has stated the Sunni communities in provinces formerly held by ISIS were the first to sacrifice for the liberation of their areas, identifying the failure in the political process as the reason for their plight. Allawi has created the Iraqi National Alliance Coalition as a platform to unite Sunni political class under his leadership. The new coalition formed on January 11 includes CoR Speaker Salim al-Jabouri, former Deputy Prime Minister Saleh al-Mutlaq and Baathist-friendly elements outside the political process. Jabouri is building up his secular credentials after quietly distancing himself from the Iraqi Islamic Party–closely tied to the Muslim Brotherhood–to form the secular Civil Gathering for Reform. An alliance with Jabouri helps Allawi highlight popular support for secular rule, while capitalizing on Jabouri’s prominent stature to draw Sunni votes particularly in home province of Diyala as well as Baghdad. Meanwhile, the inclusion of Mutlaq–a secular Sunni and founding member of Allawi’s Iraqiyya coalition of 2011– signals Allawi’s intent to recreate a similar coalition despite the existence of power struggles between its prominent figures that eventually contributed to its collapse. The inclusion of Mutlaq also allows Allawi to draw the Sunni vote from Anbar–Mutlaq’s home province. Allawi’s alliance is set to compete with Vice President Osama al-Nujaifi’s Iraqi Decision Coalition for Sunni votes. Allawi has been a political and ideological rival of Nujaifi since the collapse of their Iraqiyya coalition. Power sharing disputes, Allawi’s dwindling chances of securing the premiership and differences on Iraqiyya’s future strategy antagonized tensions between the two leaders and contributed to the collapse of the coalition after the 2010 elections. The rivalry also reflects regional political divisions, with Allawi backing the Saudi Arabia-Egypt axis and Nujaifi backing the Turkey-Qatar axis. Allawi also rejected Nujaifi’s push for increased autonomy of Sunni areas post-ISIS, stressing his support for Iraqi territorial integrity. Jabouri is also a major political rival of Nujaifi, as both lead competing wings within the main Sunni bloc in the CoR the Sunni Alliance of Forces. Jabouri and Nujaifi disagreed on the post-ISIS Sunni vision for Iraq. Jabouri called for facilitating talks with Shi’a parties to reach national consensus and Nujaifi called for confidence building measures on limiting Iranian influence, demographic changes in Sunni areas and freeing Sunni prisoners. Allawi may intensify efforts to sway support from nationalist Shi’a during post-election premiership talks. Allawi’s inability to draw cross-sectarian support particularly from Shi’a parties contributed to the failure of his 2011 bid for the premiership. He will likely look to rectify this issue by leveraging his ideological proximity to Sadrists in order to sway their support for his premiership bid. Allawi supported the 2016 Sadrist protest movement to institute anti-corruption reforms. Allawi also backed the unsuccessful Sadrist protest campaign to overhaul the electoral process through the selection of a non-politicized electoral commission and the passage of an electoral law that does not favor pre-existing dominant parties. Allawi also supported Sadrist calls for a technocratic, non-sectarian based form of government. Additionally, Allawi has joined Sadr’s identification of Iranian-backed proxies within the PMF as “shameless militias.” Allawi’s desire to maintain political independence and maneuverability likely prevented him from entering into what was expected to be a near pre-election alliance with the Sadrists. The Vice President may seek Kurdish support for his premiership ambitions. He could do this by leveraging his historical ties with the Kurdistan Democratic Party (KDP) and his support for Baghdad-Arbil dialogue to prevent further military action following the October 16 military takeover of disputed territories by Iraqi forces. Support for the Kurds during and after the September 25 2017 Kurdish referendum period came at a political cost, leading Allawi to pursue a nuanced approach to his relationship with both sides. Allawi, while deeming the timing of the Kurdish independence referendum “inappropriate,” blamed Baghdad for failing to address Kurdish power sharing concerns at an earlier stage. Allawi also blamed Baghdad for not participating in post-referendum talks that he attempted to sponsor with unidentified regional Arab countries. Allawi also stated military operations in disputed territories included the presence of Iranian forces, particularly in Kirkuk. He has appeared to dismiss Baghdad’s accusations of KDP corruption. Allawi also supports maintaining the Kurdistan Regional Government (KRG) of the federal Iraqi budget at 17%–an agreement that he secured in 2004 during his brief tenure as Prime Minister. Allawi may be an alternative premiership option compatible with U.S interests in Iraq. Allawi maintains friendly ties to the U.S and rejected Iranian influence in Iraqi affairs. Allawi also maintains strong ties to the KRG; he stressed the resolution of the Arbil-Baghdad disagreements must be constitutional and within the framework of a united Iraq. Allawi also maintains strong ties with U.S regional partners in Saudi Arabia, Egypt and Jordan. Key Takeaway: Afghanistan’s powerbrokers are in the early stages of an intense competition as they prepare for the planned 2019 presidential election. The multi-month disagreement between President Ashraf Ghani and warlord and long-time Balkh Province Governor Mohammad Atta Noor over the latter’s governorship is the first stage of a much larger battle between the two politicians for the presidency. Atta is exploiting friction caused by how President Ghani wields his power to build a network of alliances to challenge President Ghani in 2019. Meanwhile, Ghani is actively using his immense presidential power to undermine Atta’s attempts to build an opposing coalition. The internationally negotiated National Unity Government agreement that set President Ghani in place has failed to create a genuine power-sharing arrangement between the president and his opposition. Ghani’s administration has not adhered to the terms of the internationally negotiated National Unity Government (NUG) agreement that established him as President and his Tajik rival Abdullah Abdullah as Chief Executive Officer (CEO). Ghani has used the president’s significant constitutional authority and the vague terms of the NUG agreement to marginalize CEO Abdullah and to limit other Tajik rivals’ influence in governance. The Ghani administration has not implemented the agreement’s required reforms aimed at ensuring transparent elections, so Ghani’s administration is repeatedly able to delay parliamentary and district council elections. Ghani has been able to postpone, on grounds of process, calling the required Constitutional Loya Jirga to convert the Chief Executive Officer’s (CEO) position into a constitutionally mandated premiership. Such a constitutional change would create a more balanced power-sharing agreement between Ghani and CEO Abdullah, who is Jamiat’s most senior representative in the government. Ghani’s corruption reforms could drive Atta, Jamiat, and entrenched Pashtun powerbrokers to form an anti-Ghani coalition in order to secure the patronage networks they benefit from. Ghani is pushing a reform agenda that is intended to combat corruption and empower government institutions over powerful regional personalities; as a result, Ghani has attempted to remove regional warlords and powerbrokers from Afghan politics—including First Vice President General Abdul Rashid Dostum and Atta. Ghani’s anti-warlord initiatives allow Atta to build and strengthen alliances against Ghani among traditional rivals. Atta is attempting to unite Jamiat under his leadership by courting other Tajik powerbrokers and by leveraging his governorship to increase Jamiat’s influence in government. Jamiat’s negotiations with President Ghani over the Balkh governorship are an effort to reset the Afghan political system in order to increase Jamiat’s power and influence in the government. Based on Jamiat’s current demands, Atta would resign from the Balkh governorship if Ghani appoints Jamiat leaders to key government positions and if Ghani alters the parliamentary system to increase the role of political parties, like Jamiat, in parliament. If Atta is able to use his negotiated resignation to force Ghani to adhere to Jamiat’s demands, Atta would accomplish what CEO Abdullah could not: getting Jamiat leaders appointed to key positions in the government. This would be an important step towards convincing the historically fractious Jamiat party to support Atta in 2019 elections. Atta is trying to build a powerful and diverse coalition with ex-President Hamid Karzai to challenge Ghani in 2019. Atta has already created the Coalition for the Salvation of Afghanistan (CSA) with Dostum and Deputy CEO Mohammad Mohaqiq in June 2017. This alliance has united three minority groups, the Tajiks, Uzbeks, and a faction of the Hazaras. Atta is also trying to build alliances with Pashtun powerbrokers, most notably with former President Karzai. President Ghani prevented Atta from attending a December 2017 meeting of opposition parties in Kandahar, indicating Ghani feels threatened by Atta’s attempts to build alliances with Pashtun powerbrokers. Jamiat political figure Ahmad Wali Massoud met with Shah Wali Karzai, Hamid Karzai's brother and the head of the Pashtun Popalzai Tribe, in Kandahar on February 7, 2018. It is possible Massoud is working as an emissary for Atta, given their January 2018 meetings. Additionally, the powerful Kandahar provincial police chief, General Abdul Raziq has publicly supported Atta, who claimed he met with one of Raziq’s representatives in Mazar-e Sharif on February 23. Raziq reportedly hosted the meeting, which several former Karzai administration officials attended. One of the most prominent attendees was Rahmutallah Nabil, Karzai’s director of the National Directorate of Security and the leader of the Karzai-linked Mehwar-e Mardom party. Atta will struggle to create an enduring and strong partnership with Former President Karzai. It is unlikely that Karzai will choose to support Ghani, but it is also unlikely that he will fully support Atta in the presidential election. Karzai cannot run for President again, but he will likely seek the best opportunity to increase his own influence within the government. He may choose to support a Pashtun, likely one who served in his administration, during the 2019 election instead of Atta. 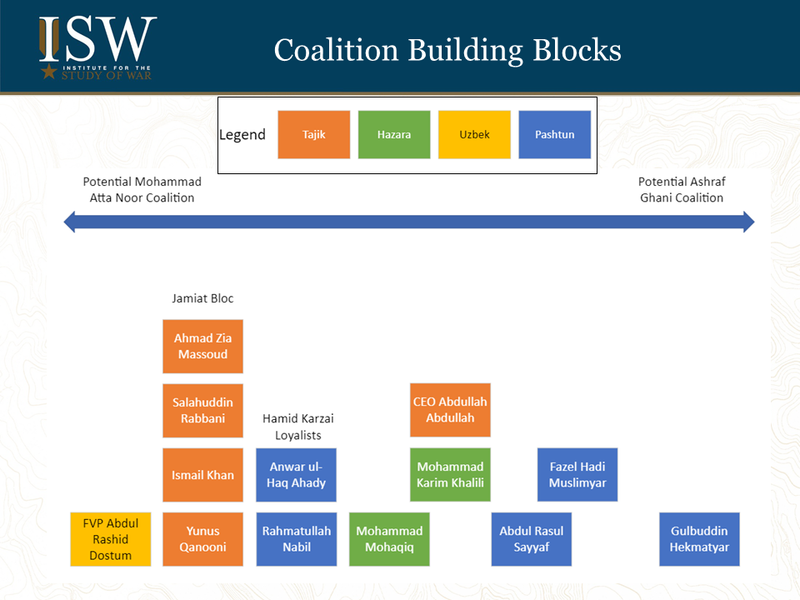 The leaders of Karzai-linked opposition groups may have presidential ambitions of their own, so it may be difficult for Atta to maintain support from these groups until 2019, especially if Karzai decides to support one of their campaigns. Additionally, traditional tensions based on past dealings with Karzai may make it difficult for Atta to convince all of Jamiat to support an alliance with Karzai. Ghani can attack Atta’s fragile network of alliances in multiple ways as he prepares for Atta’s challenge. Atta will need a united Jamiat, full support from the CSA, and alliances with powerful Pashtun leaders to challenge Ghani realistically in the 2019 elections. Ghani will work to exploit intra-Jamiat tensions, the traditional rivalries between the members of the CSA, and long-lasting tensions between Karzai and most of Afghanistan’s northern power-elite. Ghani may also try to limit the appeal of Atta and Jamiat’s current proposals to alter the Afghan system of governance. If Ghani is able to secure deals with some disenfranchised powerbrokers, both inside and outside of Jamiat, he may be able to limit Atta’s ability to contend in 2019 elections. Ghani is trying to fracture the Coalition for the Salvation of Afghanistan by creating tensions between its members. Ghani is using historic tensions between Dostum and Atta and their respective political parties to weaken the CSA. Ghani reversed a decision to replace the Jamiat deputy governor of Samangan Province with a member of Dostum’s Junbesh-i Milli party after reaching a deal with Jamiat on February 20. This led the spurned Junbesh member to threaten to seize the deputy governor’s post by force. This incident demonstrates an example of how Ghani can play one CSA member against the other. Ghani also may be attempting to split Mohaqiq from the CSA, which would weaken the coalition. Ghani met with Mohaqiq in early February 2018 reportedly to build a “Council of Elders,” which may be Ghani’s attempt to create a rival coalition. Another senior member of the CSA, Mohammad Natiqi, criticized both Ghani and Jamiat for ignoring other opposition groups during their negotiations. Natiqi said both Ghani and Jamiat are to blame for excluding other parties that supported CEO Abdullah in 2014 from discussions on implementing the National Unity Government Agreement. Atta will need the Uzbek and Hazara support he derives from the CSA to have a legitimate chance at winning a national election. However, Atta’s primary concern is likely to unite Jamiat and the Tajiks, so Ghani can use the political disputes this causes to reduce Atta’s support from the CSA. Atta is engaged in a power-struggle with Jamiat’s acting-leader Salahuddin Rabbani that may weaken Atta. Afzal Hadid, a close advisor to Atta and the Balkh Provincial Council head, claimed a resolution to the Balkh dispute was close following a private meeting between Atta and representatives from Ghani’s administration in Mazar-e Sharif on March 04-05. However, a Jamiat spokesman denied any negotiations between Atta and Ghani’s administration occurred, and Rabbani reportedly does not support Atta’s direct negotiations with Ghani’s administration. An anonymous source from Jamiat claimed Ghani is negotiating directly with Atta in an attempt to find an alternative solution to the Balkh dispute because multiple rounds of negotiations with Jamiat representatives, led by Rabbani, have failed to resolve the crisis. Like Atta, Rabbani may have been using his role leading Jamiat’s negotiations over the Balkh dispute to improve his own position in Jamiat by demonstrating his ability to support the party’s interests. Rabbani may want a more prominent role in Afghan politics given reports that he initially supported Atta’s removal and rumors that he is interested in a unified Ghani-Jamiat presidential ticket—presumably with himself as the Vice President. Ghani may have offered an attractive deal to Atta that Ghani believes will split Jamiat. However, there are conflicting reports about whether Atta and Ghani negotiated a settlement or simply set conditions for Ghani-Jamiat negotiations to resume. Some anonymous sources claimed that Atta and Ghani had reached a deal. Based on the rumored agreement, Atta plans to resign but will choose his successor and a new Balkh police chief. Additionally, Ghani will appoint Jamiat members as Minister of Education and Minister of Information and Culture, and Ghani will appoint six new Jamiat ambassadors to unnamed countries. In contrast, other sources claimed Atta’s negotiations had only paved the way for negations between Jamiat and Ghani to resume in Kabul. If Atta and Ghani negotiated a deal, Atta would likely have expanded on Jamiat’s initial demands that sought Jamiat appointments to senior government positions. While Jamiat and Atta’s demands gradually increased to include much broader electoral and constitutional reforms, Atta may believe he can use this agreement to consolidate his control of Jamiat. Ghani may believe such an agreement will exacerbate a power-struggle in Jamiat. Alternatively, Ghani may be willing to make these concessions in order to reduce the pressure stemming from the growing support for Jamiat’s reform agenda combined with upcoming parliamentary elections. The parliamentary and electoral reforms Jamiat and Atta have demanded would make it difficult to hold parliamentary elections as scheduled so this possible agreement may indicate Ghani is trying to mitigate the potential consequences of delayed elections. If Atta set conditions for future negotiations, it would indicate limited progress, but given the broad reforms Jamiat demands, a resolution may not be imminent. This would also demonstrate that Atta is confident that Ghani will be unable to split Jamiat by offering a Jamiat faction a favorable deal to abandon Atta. Ghani may try to counteract growing support for Jamiat’s reform agenda. Multiple parties have announced their support for the reforms Jamiat is demanding. Ghani has held separate meetings with multiple opposition leaders whose parties either already have or could ultimately support Jamiat and Atta. Ghani has met with Abdul Rasoul Sayyaf, the leader of the Council for Protection and Stability in Afghanistan; Hezb-e Islami leader Gulbuddin Hekmatyar; Deputy CEO Mohammad Mohaqiq; CEO Abdullah Abdullah; and Hazara Hizb-e Wahdat leader Karim Khalili. Ghani’s office said the meetings were “to discuss issues of national interests;” however, anonymous sources claimed Ghani intended to create “Council of Elders.” It is possible Ghani is trying to constrain Atta and Jamiat by creating a rival coalition focused on implementing reforms but on terms that are more favorable to Ghani. Ghani’s decision to release new electronic National Identity Cards (e-NICs) that include nationality could drive a wedge between several opposition groups. The Tajiks and Hazaras are opposed to including ethnicity and nationality on the cards, while Uzbeks and Pashtuns support the labels. One of Jamiat’s current negotiating demands includes the use of e-NICs that do not include nationality or ethnicity. Ghani may be able to use e-NICs to increase tensions within the CSA and, more importantly, could use ethnic tensions to block Atta from aligning with Pashtun leaders. As an example, General Raziq said that anyone opposed to listing nationality on the e-NICs as “Afghan” should leave the country, while Atta criticized the e-NIC release on February 17. Atta’s February 23 meeting with Raziq’s representative may indicate their emerging alliance can overcome the e-NIC issue but impassioned disagreements over e-NICs could pose challenges to Atta’s alliances. 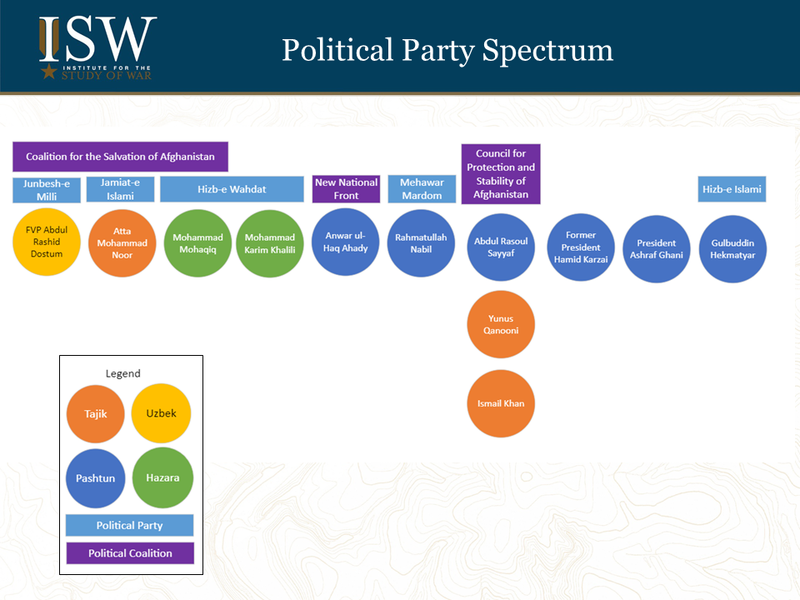 The ongoing Balkh dispute and continued parliamentary election delays could become inflection points that lead to an uncontrollable destabilization in Afghan domestic politics. The most likely indicator that either of these inflection points will cause significant problems is the outbreak of protests in Kabul. Atta has continually threatened to organize mass protests in Kabul unless Jamiat’s demands are met. As long as the Balkh dispute persists, large protests will remain a possibility. Atta said that it would be difficult for him to control a “massive movement from Balkh” that could lead to a crisis that caused the government to collapse. Large anti-Ghani protests in Kabul increase the risk of violent confrontation between security forces and pro-Atta demonstrators, which would lead to an unpredictable escalation of tensions. It’s also possible that repeated election delays could catalyze destabilizing protests. Many political parties demand timely and transparent elections, so the emerging anti-Ghani coalition may be able to leverage electoral delays to organize protests. Parliamentary and district council elections are still officially scheduled to occur on July 7, 2018, but Independent Election Commission (IEC) officials have admitted elections will likely be delayed until October. There are indications some parties will accept a delay to October, but any announcement that elections will not be held in 2018 could prompt destabilizing protests in Kabul. Given widespread demands for timely elections, protests over elections delays could grow so large and intense that Ghani is forced physically to resign and a transitional government is created. Parliamentary and district council elections must be held before a Constitutional Loya Jirga can be held. Natiqi is Mohaqiq’s deputy in the Hizb-e Wahdat-e Mardom party. Natiqi is one the six signatories of the original CSA agreement in Turkey in June 2017. Jamiat and Atta initially demanded Jamiat members be appointed Minster of Education, Minister of the Economy and the ambassadors to Tajikistan and Bangladesh. Control of the Ministry of Education is a crucial concession to Jamiat because the ministry is the largest civil employer in Afghanistan and is a key component of Afghan patronage networks. The Council for Protection and Stability of Afghanistan (CPSA) consists mostly of former Karzai administration officials who had previously supported Abdullah in the 2014 election. They have previously demanded Ghani implement reforms and hold timely and transparent elections. Hekmatyar is not likely to support Atta but a faction of Hezb-e Islami supports Jamiat’s agenda and Hekmatyar has said timely elections are necessary. “Afghan” has historically been used to refer to the Pashtun ethnicity. Atta was referring to protests planned to coincide with the Kabul Process meeting that he later postponed.